Description: Recommended enhancement: Hybrid. Since the dawning of Lore, the Guardians of AdventureQuest have been stoic, loyal fighters, proving their undying dedication on the battlefield. These ancient warriors harness a power unlike any other. Special Effects: Guardians gain mana from all hits landed in combat,and especially on crits. The amount depends on damage relative to "their own" HP total. Description: A strong attack known only to disciplined fighters. Awefully strong attack, trained by all Guardians. Damage dealt is based on weapon damage. Description: Furiously bombard your opponent with strikes. Damages and cripples your target, reducing outgoing damage by 5% for 10 seconds. This effect can stack up to 3 times. Note: Deals 135% weapon damage. Description: Use the pointy End of your weapon for stunningly sharp attacks. Applies Keen, increasing critical strike chance by 15% and has the chance to stun the target briefly. Note: Deals light damage. Must hit the opponent to activate effect. Lasts 10 seconds. Description: Empower yourself. Releases blinding damage if your weapon is Keen, otherwise increases your resistance to incoming blows. Notes: Must hit the opponent to activate effect. Guardian Shield reduces damage taken by 50% and lasts 10 seconds. Description: Calls forth mighty dragon flames to scorch your opponents. Notes: Hits 3 targets in moderate range. Description: Deals moderate damage and forces the target to turn it's attention to you for 6 seconds. Description: Strikes up two targets in melee range, dealing light damage. Also applies Crushed, reducing the targets's outgoing damage by 15% and increasing incoming damage by 10%. Lasts 10 seconds. Description: If the target is a monster, deals damage based on the amount of damage that monster has done in the current fight. Deals moderate damage to players. Notes: Deals DPS as damage. Description: Heals a friendly target for a small amount. Also applies Safeguard, absorbing all incoming damage up to an amount based on Attack Power. Lasts 8 seconds. Note: Amount is based on 174% of your weapon damage. 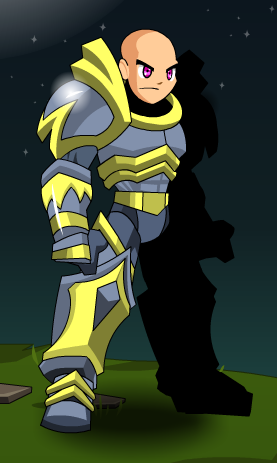 This item is themed from the Guardian Plate from AdventureQuest. Thanks to Pulveriser, Tendou no Mazo and Yetimen1.